How your brain remodeled itself to create the unique person that is reading this book. One of the clearest descriptions of the forward-prediction (“memory association”) properties of the human brain has been provided by Jeff Hawkins in his very readable On Intelligence. I’m pretty certain that Hawkins would agree with me that ‘selective attention’, ‘working memory’ and ‘prediction’ are all different facets of the same mechanistic coin. Gusnard DA et al. (2001) Medial prefrontal cortex and self-referential mental activity: Relation to a default mode of brain function. PNAS 98:4259. Note that activity in this cortical area weakens progressively in most old brains—which is presumably one of the neurological bases of the slowly dissolving “self” at an older age in some of those people that we see this happening in! Molnar-Szakacs I and Arzy S (2009) Searching for an integrated self-representation. Commun Intgr Biol 2:365. Pinker S (2003) The Blank Slate. The Modern Denial of Human Nature. Penguin London. For Pinker, Nature >>>> Nuture. He’s elaborated his cultural anthropology theme in another half dozen or so books. Pinker is a good story-teller who can draft a strong argument from cultural anthropology and linguistics without drawing much from brain science—and has even gone so far as to write another very presumptive book called “How the Mind Works”! Indeed. Try Dawkins R (1999) The Extended Phenotype: The Long Reach of the Gene. Oxford U Press. Dawkins is a strong advocate of genetic determinism; but those arguments should not be extended to the point that we can be explained more or less entirely as direct extensions of our compositional genetics. Something more interesting happened, within the span of our (brain’s) life, in the creation of you, or me, or Dr. Dawkins. Dawkins has written another half dozen or so popular books that describe we humans in rather harsh, materialistic terms. Because he’s a clever writer and holds a strong hand, these aspects of his argument bear weight. But remember that you aren’t just a hand-me-down from your genes as a pre-determined Person, and that it is just as wrong to view we individual humans as a product explained by (often, victimized by) our genetics, as it is to view us as a hand-me-down from the spirits (Dawson belittles anyone daring to believe such a thing).The person that YOU are has been richly elaborated and extended, via your brain plasticity—and your brain is not finished with the job!Of course as Dawson, Pinker and Wilson so compellingly argue, there’s no escaping the fact that you are HUMAN. (For another readable version of this argument, see Desmond Morris’ classic, The Naked Ape: A Zoologist’s Study of the Human Animal, 1999, McGraw-Hill, New York.) They just fall short, in fully appreciating that beyond the genes, in each lifetime, there comes the shaping and elaboration of just about everything about your personhood that to you really matters—and that they, more than most of us, are really proud of! The consequences, for reading and academic achievement, of having a rich or an impoverished early language experience ala Bonnie & Buddy are spelled out in a number of large-scale studies documenting language exposure vs school achievement conducted over the past 20 years. For example, see Risley R, Hart B, Bloom L (1995) Meaningful Differences in the Everyday Experience of Young American Children. Paul Brookes Publ., Baltimore. It might be noted that a childhood marked by persistent stress or abuse adds additional, powerful neurological burdens that can have powerful additional impacts on academic success. See, for example, McEwen B, Lasley EN (2001) The End of Stress As We Know It, Nat’l Acad Press, Washington.Some kids come to school, through absolutely no fault of their own, without having much of a chance for success—unless their plastic brains undergo appropriate, corrective training. The story of our creation of software designed to rapidly recover more normal language function in a child that had very poor language exposure in early childhood, or who had genetic weaknesses that delayed and degraded normal language development, is told in Chapter 29 (see www.soft-wired.com/ref/ch29).For more information about these language-, cognitive-and reading-recovery training programs, see www.scientificlearning.com. Brain Fitness News is a monthly electronic newsletter that provides information about brain fitness and cognitive issues. Learn more. Copyright © 2019. 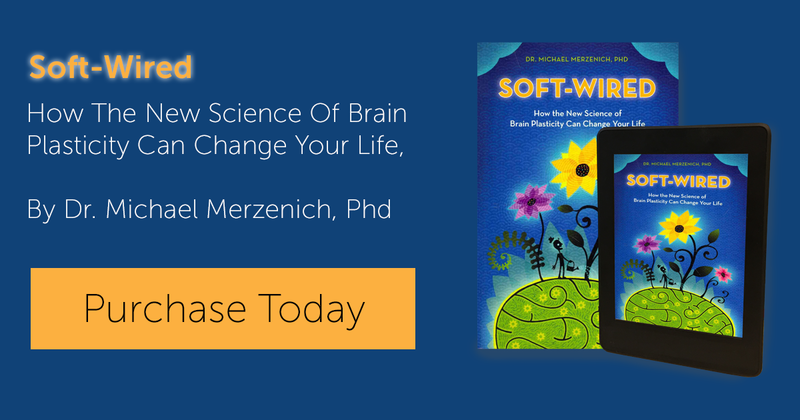 Soft-Wired by Dr. Michael Merzenich.